Since 1972, JPubE has ranked among the most prestigious monthly peer-reviewed academic journal covering public economics. The Journal has a particular field emphasis on the application of modern economic theory and methods of quantitative analysis. It provides a forum for discussion of public policy of interest to an international readership. 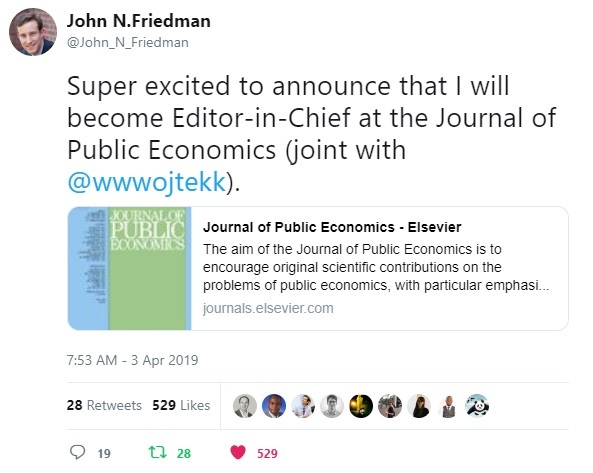 Friedman’s appointment follows four years on the Editorial Board of the American Economic Journal. Opportunity Insights co-founder, Raj Chetty, also served as JPubE Editor-in-Chief from 2012-2015.